This is an excerpt of a feature from Unwinnable Monthly #109. If you like what you see, grab the magazine for less than ten dollars, or subscribe and get all future magazines for half price. When CD Projekt Red first announced Cyberpunk 2077, I was cautiously optimistic. By all accounts, the studio’s Witcher 3 was a genre-defining RPG that, if anything, was only held back by its adherence to the source material’s conventional European Low Fantasy setting. But Cyberpunk 2077 felt like it could be different. It’s in the future! There could be people of all races! Genders! Body types! And then they announced that they had no plans to include non-binary genders. 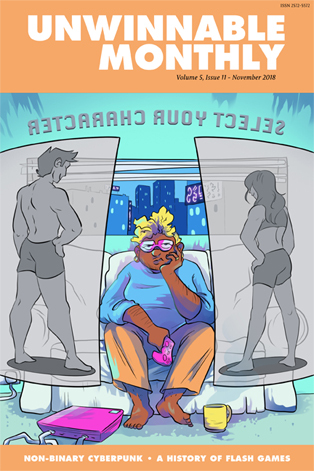 I know so many trans people who have found comfort in the cyberpunk genre. The trans girl who started coding after reading Case’s ICE-breaking antics in Neuromancer. The transmasc who was inspired by Akira’s butch icon Chiyoko. My genderfluid friend who saw themself in Major Kusanagi from Ghost in the Shell’s ever-shifting consciousness and body. The list goes on. I sympathize with those disappointed by the Cyberpunk 2077 news, but at the same time, I think it’s necessary for us to desire more than just small kernels of representation. Characters who break with the gender binary are a welcome sight, but we should also recognize that for transgressing gender conformity, not all people are accepted equally. The LGBTQIA community is no stranger to white supremacist tendencies and it’s no different for non-binary, gender nonconforming and gendervariant people. Racism, colorism, fatphobia and ableism all stain queer communities, and there is a very specific set of features that are valued and read as desirable because of them. When you’re marginalized on multiple axes of oppression, you can break the gender binary, but only so much before you’re torn down or put in harm’s way. Ashleigh Shackelford writes about how white supremacy denies her agency over her own non-binary identity, where her black fat femme self is read as “too strong, too big, too much, too powerful.” I know that as a thin and white non-binary person, I am given more room to transgress gender norms while still being accepted as agender. By no means is androgyny synonymous with being non-binary or vice-versa, but Google image results for “androgyny” is a telling snapshot of what is considered acceptable for going outside the bounds of “male” and “female.” If you’re having trouble picturing what is considered desirable, you don’t need to look any further than celebrities like David Bowie or Tilda Swinton. Both gender-challenging icons; both thin, white, abled, conventionally attractive and, at the end of the day, they’re cisgender. You’re less threatening to the status quo when pearl-clutching bigots can go “Oh okay, phew, they’re still a man/woman.” Black, indigenous, disabled and fat non-binary people are often denied legitimacy and wholeness of their gender nonconformity. To craft a story involving non-binary characters, cyberpunk needs to involve and focus on these members of the marginalized group, lest they simply reproduce a white, hegemonic representation of what “non-binary” can mean. Liam Conlon is a writer, artist, and designer living just outside Washington, D.C. They love lipstick, giant robots and keeping it dialectical. You can find them on Twitter @Flowtaro. 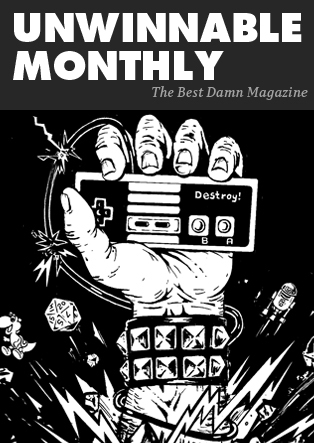 You’ve been reading an excerpt from Unwinnable Monthly Issue 109.